﻿ Unic Hotel, Kota Kinabalu | FROM $38 - SAVE ON AGODA! "Nice, clean and cossy hotel room." Have a question for Unic Hotel? "Very comfortable room, walking distance to filipino market, and will stay here again." "Very spacious & comfort room." 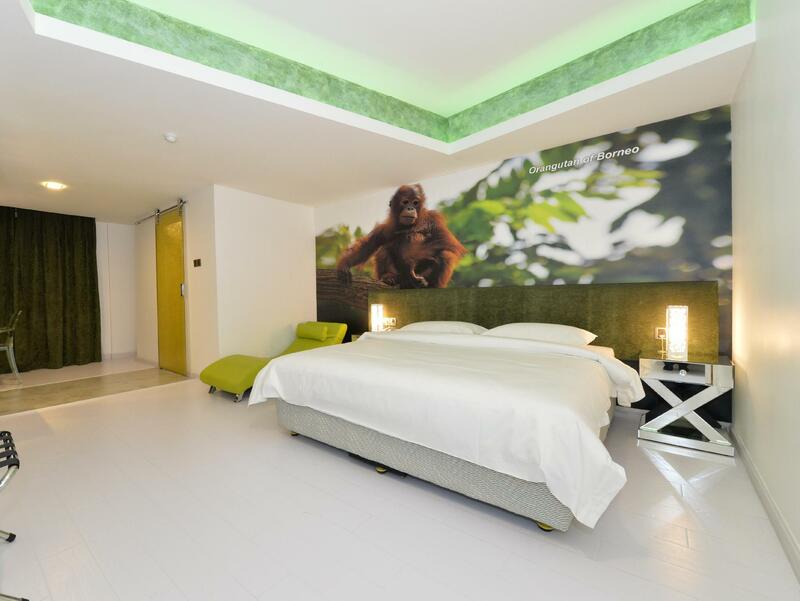 For travelers who want to take in the sights and sounds of Kota Kinabalu, Unic Hotel is the perfect choice. From here, guests can enjoy easy access to all that the lively city has to offer. With its convenient location, the hotel offers easy access to the city's must-see destinations. The facilities and services provided by Unic Hotel ensure a pleasant stay for guests. While lodging at this wonderful property, guests can enjoy free Wi-Fi in all rooms, 24-hour security, convenience store, daily housekeeping, 24-hour front desk. 33 rooms spread over 3 floors provide a warm and pleasant home away from home. 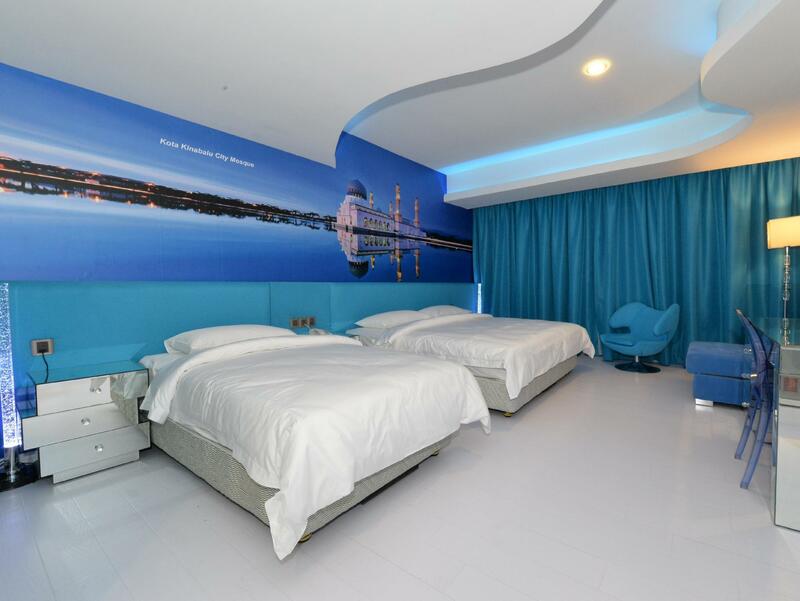 Modern comforts such as television LCD/plasma screen, internet access – wireless, internet access – wireless (complimentary), non smoking rooms, air conditioning can be found in selected rooms. Besides, the hotel's host of recreational offerings ensures you have plenty to do during your stay. 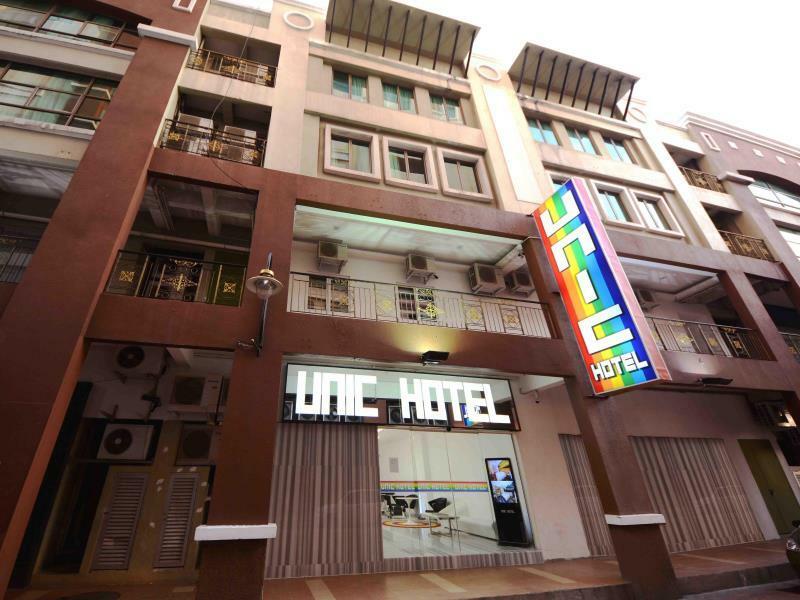 Unic Hotel is an ideal place of stay for travelers seeking charm, comfort and convenience in Kota Kinabalu. Suitable for short stay. Relatively new hotel and the facilities are good. Good location as has nearby mamak and chinese eateries. Downside probably was due to no designated parking area for the guests. So we parked at the warisan square instead for rm12 overnight. Recommended to book family suite. Nice ambience. Initially the standard was good but now it kinda falls back a bit. Cleanliness is still there but those small things that makes this place a good experience kinda falling to pieces now. A little bit more on the maintenance wouldn’t hurt. Location is EXCELLENT. Nearest market is only about 7 minutes walk. Amazing sights where you get to observe fishermen selling their fresh catches; or enjoy cheap seafood at the market's food court. If you know how to bargain, stalls will be more than happy to give their best rate. Freshly caught lobster as cheap as RM18 (SGD6) per 100g. Best location to catch the sunset at the Waterfront (only 3-4 minutes walk). Amenities-wise; sufficient. Toothbrush, toothpaste, shower gels and shampoo provided; got iron and iron boards + hairdryer. Room interior is not too shabby and quite modern. TV channels are limited but HBO and BBC are available. You can hear noises from outside. First time booked a jacuzzi room. but unfortunately the water is not hot enough. The jacuzzi room was spacious and clean. Very spacious & comfort room. The carpet outside the room a bit smelly. Clean room & strategic location. Easy to find foods & shopping mall is around. 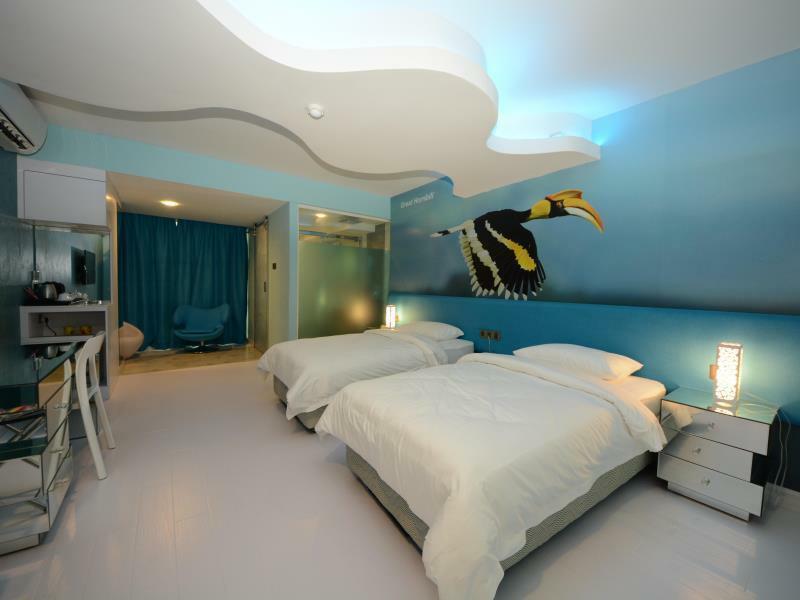 Pros - Clean, neat, colorful & modern looking room with adequate facilities. Hotel location is very highly strategic, surrounded by malls, cafes, convenience shops, bar, pubs & restaurants; all within walking distance. Cons - I wish there's a dedicated parking spot or location for travelers who are driving. -Great location near shopping mall,seafood market,night market..but difficult for parking space.. -clean room and toilet.. but the water heater not running so well that somtime hot and sometime cold. -lock of our bathroom door cn’t lock it. -totally its nice and unic hotel. -will come and stay at this hotel again. Sticky note : I accidentally left my ID badge in the room. The management called and offered to post my badge back to me via Poslaju, for FREE. To those who called me (i forgot your name), Thank you so much for your hospitality. 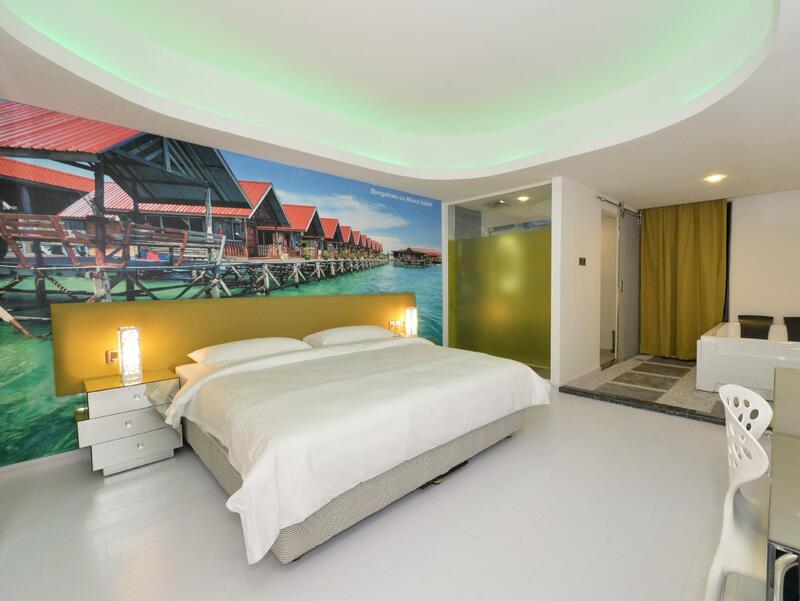 Review: This hotel is right beside 7E and The Klagan (CP area). Apparently I have no choice but to pick this hotel since my regular hotels (Klagan and Imperial Boutec were fully booked). So, i already expecting this hotel to be a mediocre budget/boutique hotel this time. But boy, i was totally wrong! Haha. In short, this is one great hotel. Lobby is great with a sense of high boutique hotel kinda style. Check in / check out was smooth. Lift was fast. The general feeling about this hotel was great. But that's not until you enter the room. I was surprised of how complete this room is. The have almost everything a high end hotel might have (or even more). They have a gorgeous well-lit plaster ceiling and they even have A TOUCH SCREEN MIRROR WITH LED RING LIGHT right in the bathroom. How cool is that? Haha. The bed was excellent, A/C was super cool. Lots of pillows, complete toiletries, waterfall shower was superb, selection of TV was great, bathrobes provided with slippers, sajadah, mini bars complete with soft drinks etc. All in all, i am very very satisfied with this hotel. Definitely going to be my favourite hotel when in im KK. The room is smell, the facilities is old already, especially in the bathroom. The shower is lost control. I try to request to change the room, but the staff said all the rooms full. Btw, the staff is very helpful. There are seafood restaurant, korean food, indian food, grocery stores, massage right below the hotel. Just beside to centerpoint shopping center. And also near the harbour where pubs and nice food located. Only comment abt the bathroom. It is not clean. And it shd be a sliding door instead of a openclose door concept. Very inconvenience to guests. Very good budget hotel in town with shops, restaurant, market and shopping center, just next to each other. The room theme design is very pleasing and make you relax and cosy. Best budget hotel ever stayed. Thank you.